There’s a comic book-style explosion on the front of an aircraft hangar here at Condor Flats. An eye-catching orange jet is frozen at an upward angle. This scene represents test pilot Chuck Yeager breaking the sound barrier on October 14, 1947. 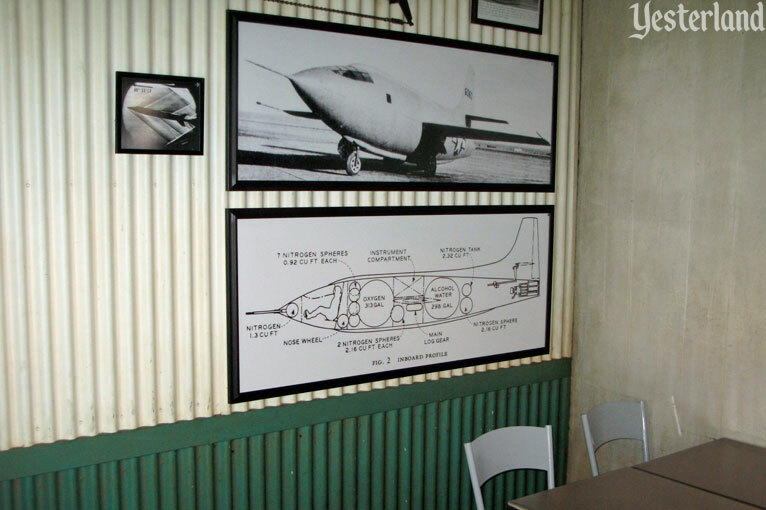 The orange jet is Yeager’s experimental U.S. Air Force aircraft—the Bell X-1, “Glamorous Glennis” (named as a tribute to his wife). This Bell X-1 is a replica. The real one is on display at the National Air and Space Museum in Washington, D.C.
Did the Bell X-1 grab your attention? 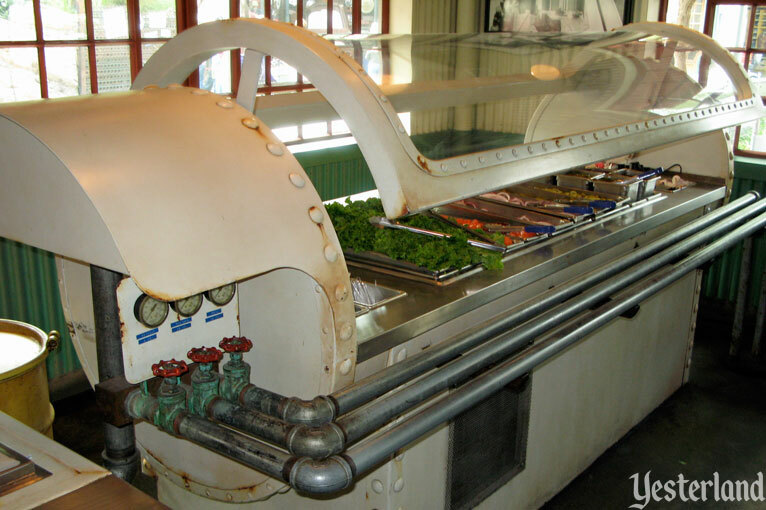 It’s supposed to draw you into Taste Pilots’ Grill. Haha. Test pilots, taste pilots. There’s no end to the puns around here. Before you go in, check the menu to the right of the entrance. The bleu cheese burger is called the Wild Bleu Yonder Burger. 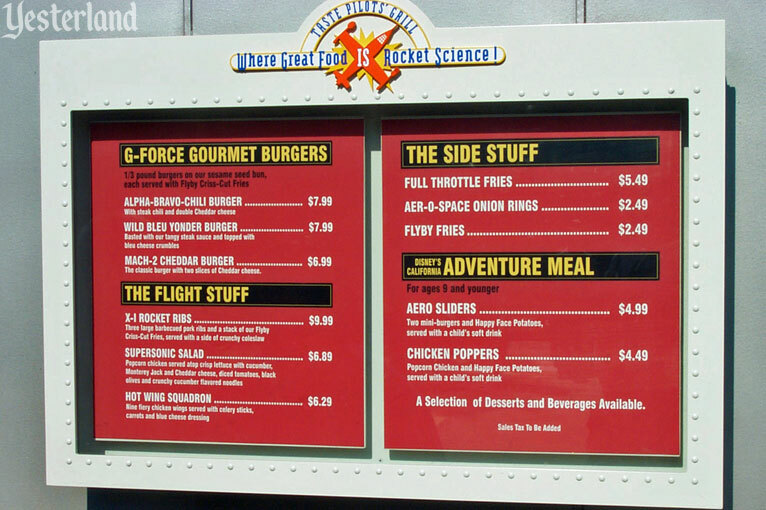 Tom Wolfe’s 1979 best-selling book about post-war test pilots and the early astronauts was called The Right Stuff, so this menu has The Flight Stuff and The Side Stuff. Once inside, look up at the inside wall above the entrance for the other side of the explosion. As you wait to order, look at the full menu above the counter. 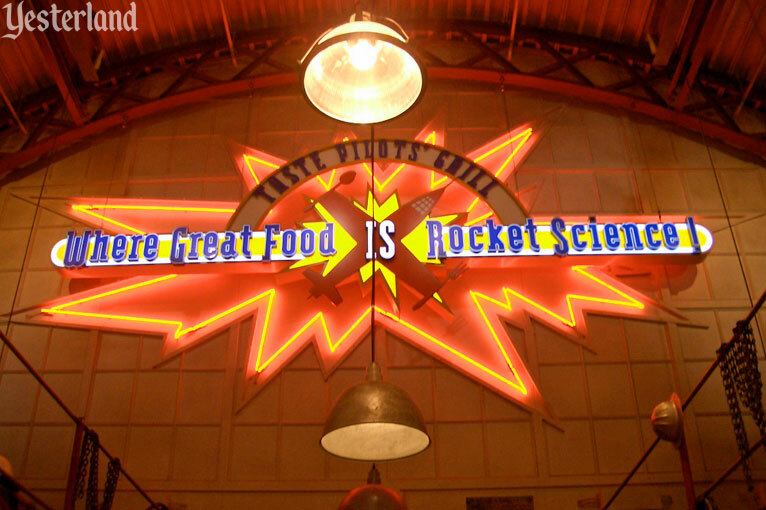 Figure out the difference between Full Throttle Fries and Flyby Fries. Service is usually pretty fast. Before you take your tray to a table, there’s another stop you’ll want to make. Head to the well-stocked toppings bar and pile on traditional burger toppings such as lettuce, tomatos, and onions—or create a more interesting taste profile with green chilies, pico de gallo, and various sauces. Turn your burger or sandwich into a feast. 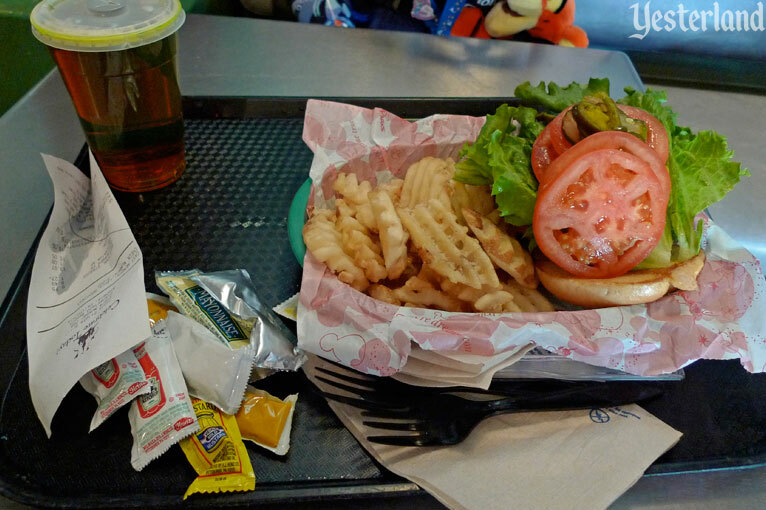 You can also top your criss-cross Flyby Fries with barbecue sauce, hot sauce, salsa, jalapeños, or anything else from the toppings bar. 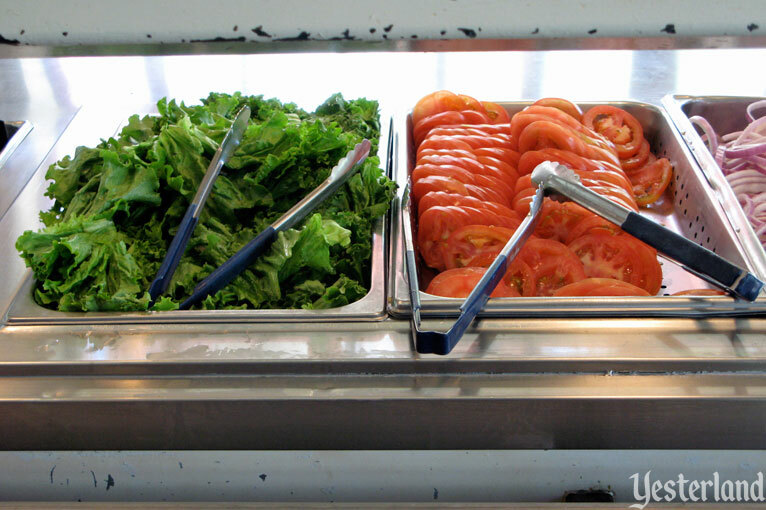 The toppings bar has beautiful large lettuce leaves and substantial tomato slices—not shredded lettuce or chopped up tomatoes. Yum! 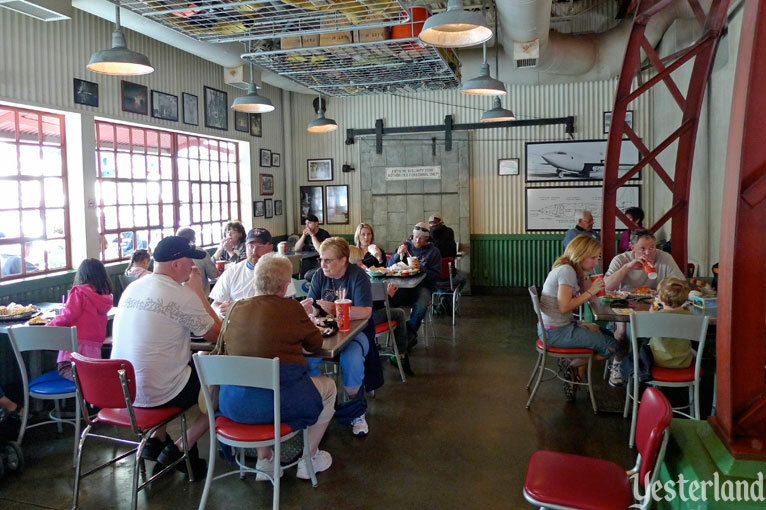 Grab a table inside this airfield hangar repurposed as an eatery. 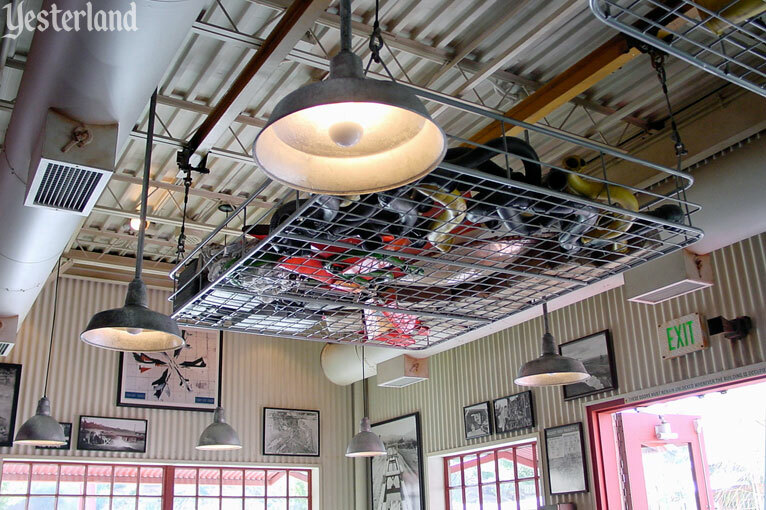 Pretend you’re at a hangout for test pilots, with mementos of their accomplishment decorating this utilitarian space. Sorry. 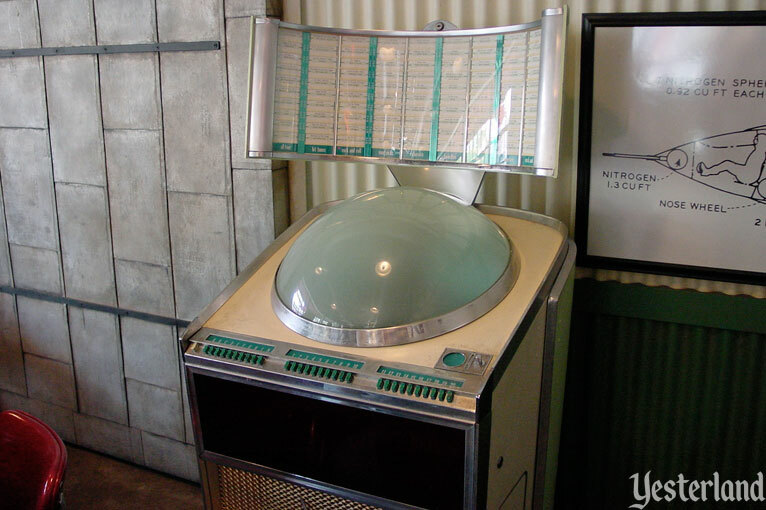 The jukebox is not operational; the coin slots are sealed. That’s intentional. There’s a music loop with over an hour of aviation-oriented songs, such as “Come Fly With Me” by Frank Sinatra, “Space Oddity” by David Bowie, and “Straighten Up and Fly Right” by the Andrews Sisters. If it’s a nice day, you might prefer to sit outside. 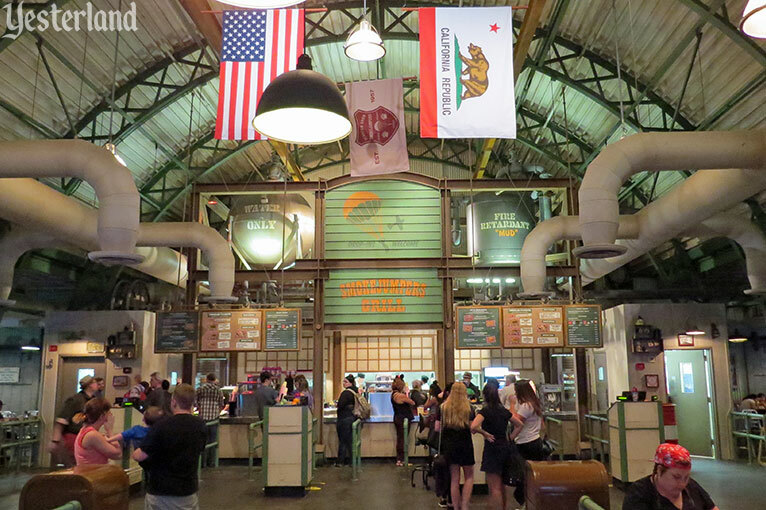 Who says theme parks are not museums? 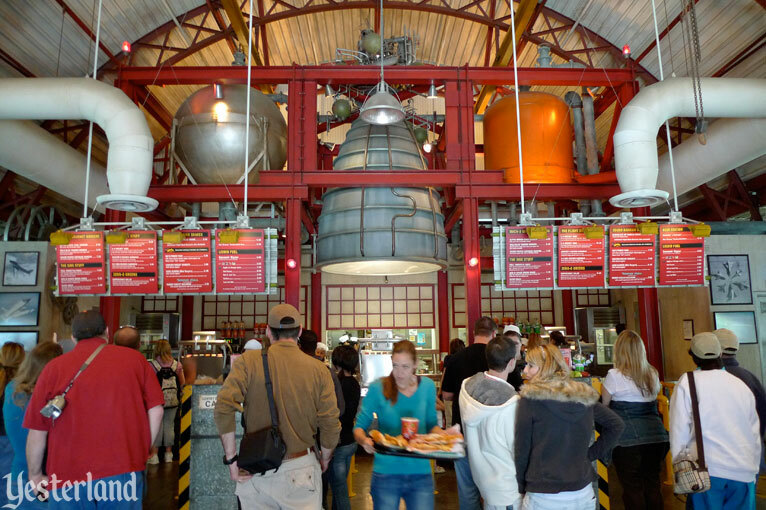 If eating burgers and other fast foods in an industrial setting makes you feel like a test pilot, then this is the restaurant for you. 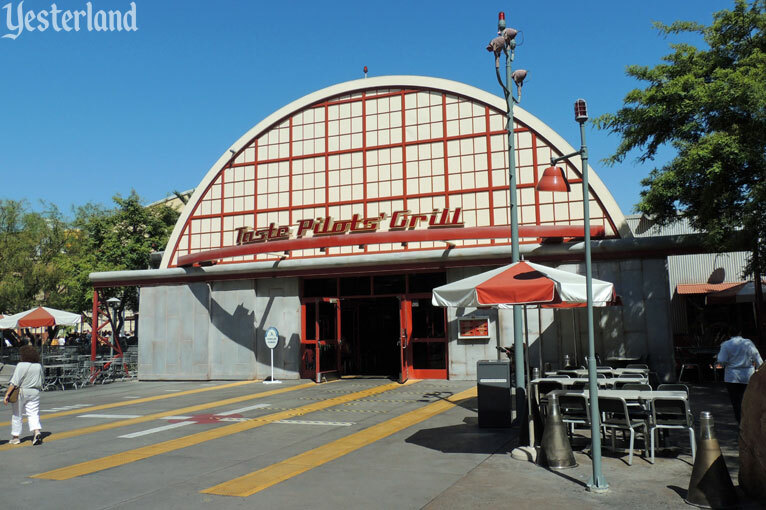 Taste Pilots’ Grill at Condor Flats was an opening day restaurant at Disney’s California Adventure in February 2001. Condor Flats had trouble conveying the theme of a “a high-desert airfield dedicated to the wonder and ingenuity that helped spawn California’s legendary aviation industry.” Originally a sub-land of the park’s Golden State land, the “runway” was squeezed between Grizzly Peak, Disney’s Grand California Hotel, and the tall show building of Soarin’ Over California (a part of Condor Flats). It felt more like a narrow mountain valley than an open desert. As the trees grew, the desert theme became even less convincing. The opening of Cars Land in June 2012 gave the park a spectacular desert land. 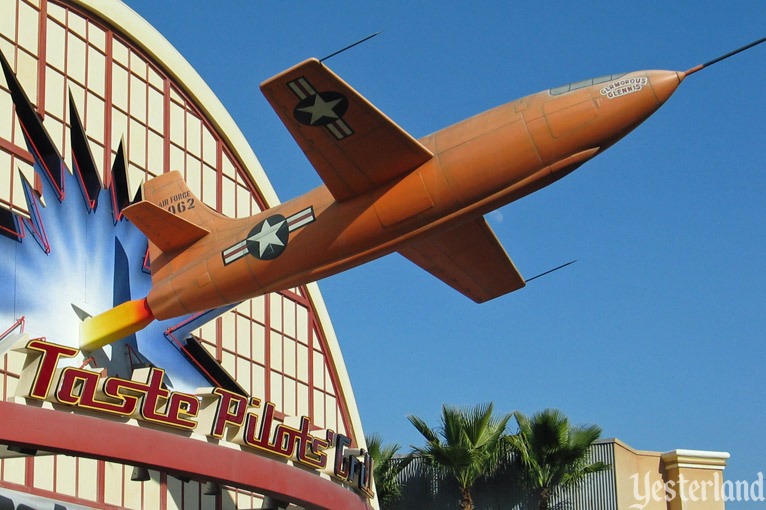 The Bell X-1 on the restaurant’s exterior was an odd feature. As a decoration “bolted” onto the façade, it did nothing to add authenticity to Condor Flats. It was not something you would see at a real airfield. 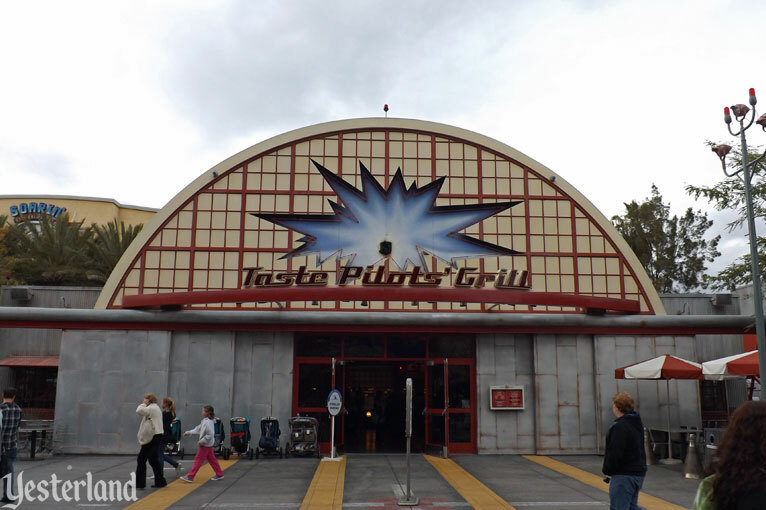 Taste Pilots’ Grill remained relatively unchanged until the fall of 2012. That’s when the Bell X-1 and the comic book explosion disappeared. More substantial changes to Condor Flats would have to wait for a budget. 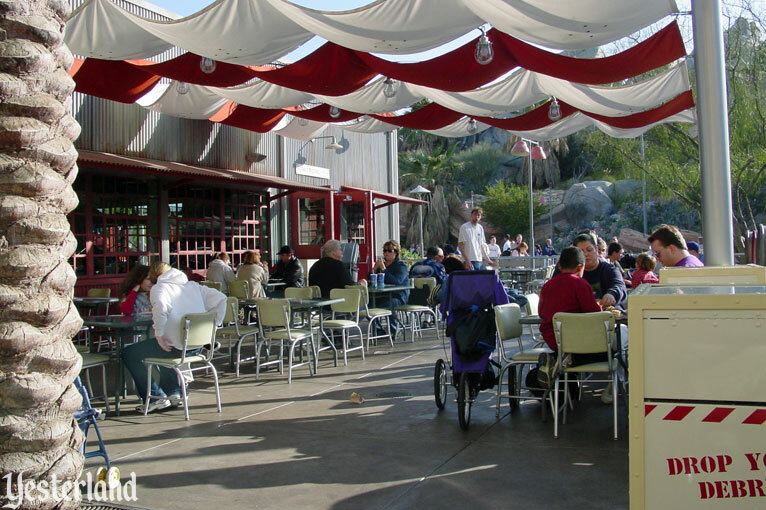 Finally, in 2015, Condor Flats would be merged into Grizzly Peak. Smart! 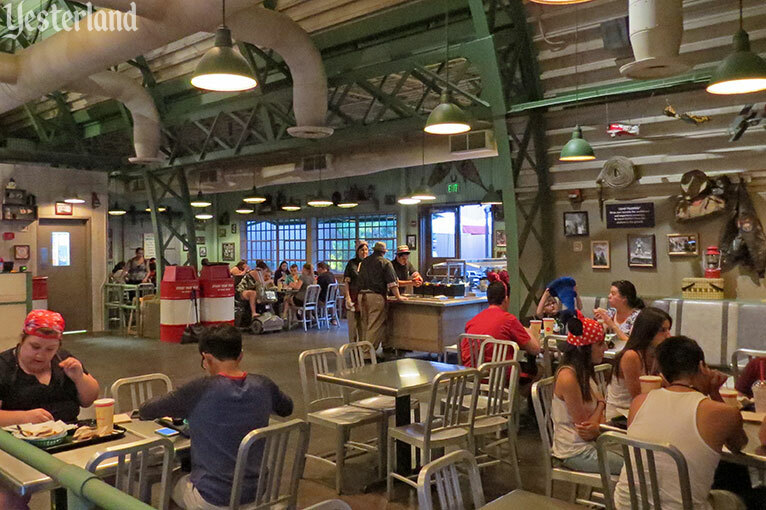 But instead of erasing the airfield theme entirely, it would be a hybrid, becoming the Grizzly Peak Airfield section of Grizzly Peak. 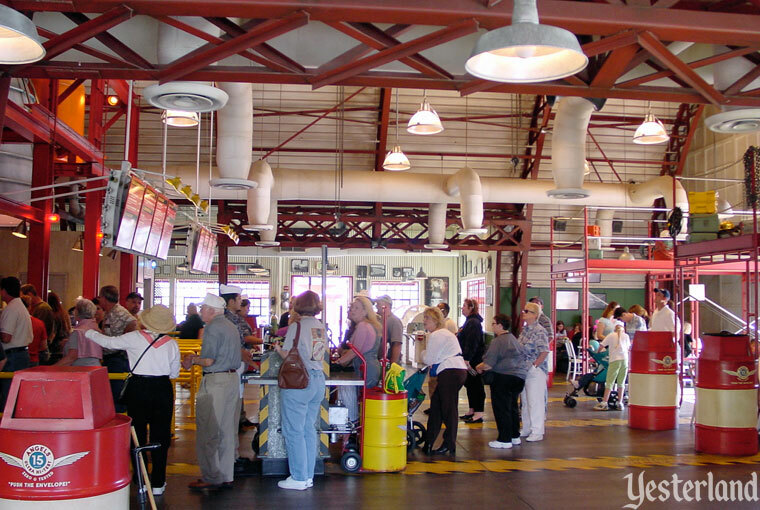 That way, the existing structures could be reused with only cosmetic changes—paint colors, siding, signage, architectural details, exterior and interior decor, and place names. Tall evergreen trees and other mountain landscaping complete the new look. 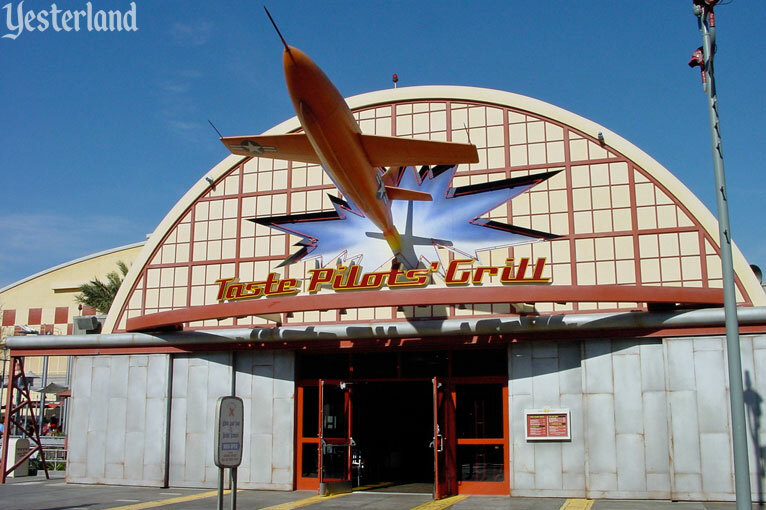 Taste Pilots’ Grill closed January 7, 2015 and reopened March 20, 2015 as Smokejumpers Grill. 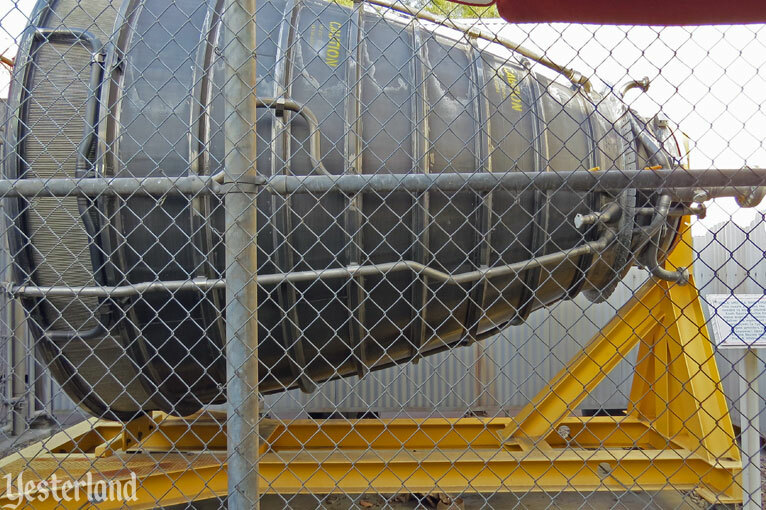 The rest of Grizzly Peak Airfield opened less than two months later. 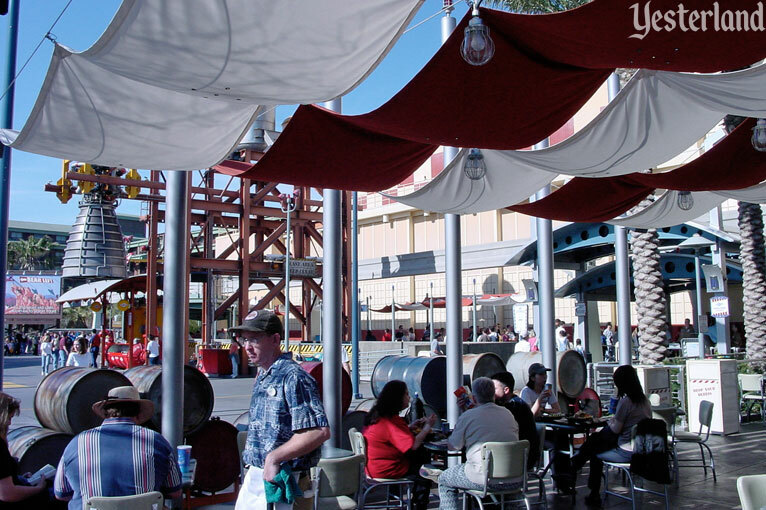 Thanks to talented Imagineers, the theming is a dramatic improvement. 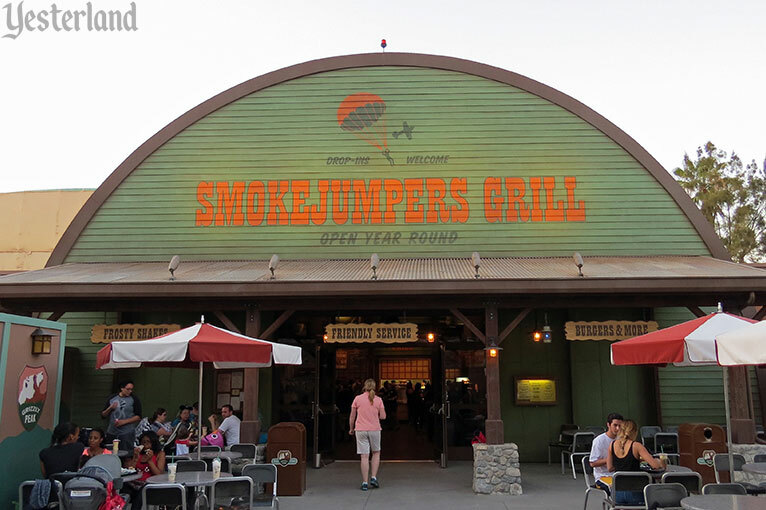 The restaurant’s new theme replaces one group of daring individuals (test pilots) with another: smokejumpers—airborne firefighters who parachute into remote areas threatened by wildfires!